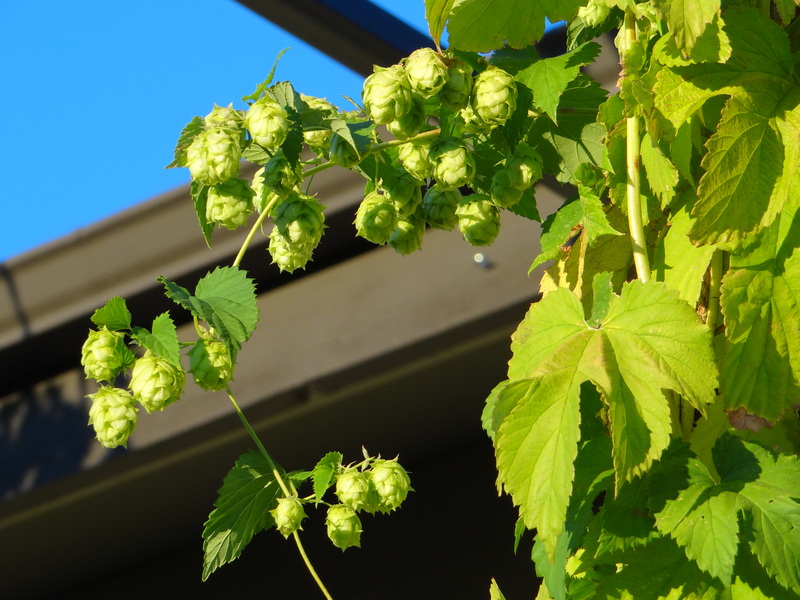 Welcome back for the second installment of my two part series on Ohio grown hops. Yesterday we got the brewer’s perspective. For the most part everyone was supportive, some downright enthusiastic, about using local hops. At the same time there were many questions about the supply, or lack thereof, and quality of local hops. Several breweries use local hops in limited release fresh hop beers, but the lack of pelletized hops severely limits their use at times other than the fall harvest. Wanting to hear the other side of the story I reached out to Brad Bergefurd, a Horticulture specialist who leads efforts on hop research at the Ohio State University extension office in Piketon, Ohio (thanks to Fred Lee at Actual brewing for putting me in contact with Brad). Brad was kind enough to answer my questions on the past, present and future of hop farming in Ohio. (1) Washington 32,205 acres; (2) Oregon 6,807 acres; (3) Idaho 4,975 acres; (4) Michigan 320 acres; (5) New York 250 acres; (6) Wisconsin 170 acres; (7) Colorado 125 acres; (8) California 85 acres; (9) Ohio 50 acres; (10) Vermont 45 acres. 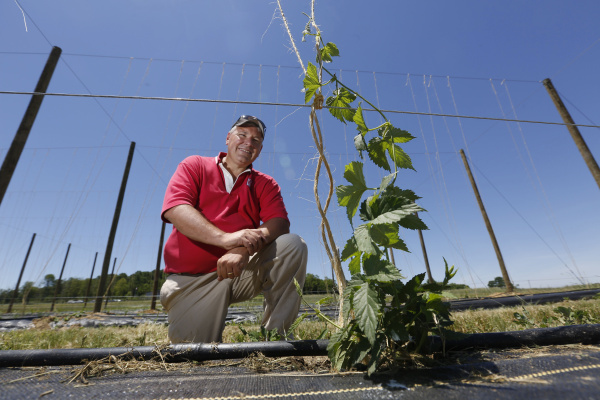 Ohio State University horticulturist Brad Bergefurd shows off a newly planted hops bine in a photo taken in Piketon on June 4, 2013. This photo originally appeared in the Columbus Dispatch. Pat: How long have you been in your current position and how did you get involved in reviving hop production in Ohio? Pat: As I understand it hop production in Ohio died out sometime around prohibition. Was Ohio a major producer of hops in the late 19th and early 20th century, and if so where were they grown? Brad: Yes, hops used to be grown throughout Ohio. Pat: What factors led to the demise of the industry? Brad: The same issues we have today the hops aphis (louse it was called back then) and downy mildew a devastating fungal pathogen, production moved west due to the dry conditions that reduce downy mildew and less hop aphid pressure. Pat: What makes hop growing centers like Yakima Valley and Willamette Valley better/easier places to grow hops than Ohio? Brad: Low moisture and humidity levels break the disease cycle therefore fungal disease pathogen development is reduced unlike here in Ohio and the Midwest in general, which tends to have lots of moisture, humidity, and heavy disease pressure from the south and east. Pat: How long does it take between the first spring when a farmer plants hops and the time when that parcel of land starts producing commercially viable quantities of hops? Brad: We can harvest a small baby crop in the first year, but really do not get into full production till after the third season. Pat: Is it known what varieties of hops grow well in Ohio and which ones don’t? Brad: Well from our preliminary research I believe we can grow them all in Ohio. Some will be workhorses, some will be low yielders, and some will be more resistant to disease and pests than others. We will have a better idea as our research continues. We currently have 39 planted in research trials. Pat: Among current planted acreage what hop varieties are the most popular with growers? Brad: Cascade, Nugget, Brewers Gold, and Columbus, but many are being grown. Pat: What quantities of hops are being grown in Ohio at this point in time? Brad: From talking with growers and plant companies I estimate 200 acres of hops are being grown in Ohio at this point in time. We estimated 100 acres in 2014, and we estimate that planted acreage has doubled this spring. Pat: How does that number reconcile with estimates I found online of 50 acres from the Hop Growers of America? Is there a discrepancy? Pat: I spoke to a brewer with Batch Brewing in Detroit back in May he told me that nearly 90% of the hops they use are grown in Michigan. How did the state up north get the jump on us in the hops race? Brad: Well Michigan and New York have been at it longer than us and their departments of agriculture and state universities have supported development of their hops industry for almost 10 years now. We have not had that luxury in Ohio, the only exception being the grant funds that our Ohio Hop Team have applied for and received. Also the craft brewing industry in Michigan grew much faster and earlier than ours in Ohio. When Governor Kasich was elected the license costs to establish a new craft brewery were reduced making it more feasible for new breweries to establish. Pat: For fresh whole cone hops what is the window of time they can be used in brewing? Brad: For the green brew market they need to be harvested and into the brew kettle within 24 hours. Now for dried whole leaf cones they can be packaged in air tight container and froze for about a year. Pat: When I asked local brewers to share their thoughts on Ohio hops the main obstacle to greater usage was the lack of facilities for processing and pelletizing hops. Brad: That is what they say but the reality is that as our growers get into production they are building and buying the facilities needed for processing and pelletizing. It’s just another infrastructure cost of hop production. Pat: Do you have any projections on the timeline when pelletized Ohio grown hops would be available for brewers? Brad: There are already many growers who are pelletizing. Editor’s Note: I did a little searching on the internet to try and find growers who offer pelletized hops. I found that Mankato Farms in New Carlisle and Ohio Valley Hops near Mason offer pelletized hops (Ohio Valley for the first time beginning with the 2015 crop). Based on Brad’s comments this is likely just a sampling of sources for pelletized Ohio grown hops. Pat: What does it take to establish hop processing and pelletizing facilities in Ohio? Brad: Ohio farmers are already establishing facilities for processing hops, but people should know that they need to be approved and inspected by the Ohio Department of Agriculture. Facilities for processing hops (grading, drying, processing, storing, etc.) will need to pass an Ohio Department of Agriculture Food Safety Audit and Inspection prior to commercial use. Growers should contact ODA food safety for pre-inspection prior to building or refabricating their processing/drying facility. This facility will have to be inspected annually by ODA prior to the processing season. Interested parties can contact one of these folks when they are ready for a pre-inspection: Jason Holleran (Jason.Holleran@agri.ohio.gov), Matt Fout (MFout@agri.ohio.gov), or Jason Channels (JChannels@agri.ohio.gov). They are all located at Ohio Dept of Agriculture, Food Safety Division, 8995 E Main St, Reynoldsburg, OH 43068, (614) 728-6250 or foodsafety@agri.ohio.gov. Pat: Any tips for would be commercial hop growers? Brad: There are many things to consider but here is my to do list. To be economically successful as a commercial hops grower these points MUST be addressed and included in your hops business plan at least a year before you choose to plant. (Editor’s note: This list has been edited for brevity, I strongly encourage those who are seriously interested in growing hops to get in touch with Brad at bergefurd.1@osu.edu). Line up plants/rhizomes of the varieties your buyers want to purchase by January to guarantee amounts and quality. It has been very hard to find the quality and varieties that are in demand. This is the biggest start up hurdle in my opinion. Get your soil analyzed for nutrients and acidity to see how many additional elements you need to apply to get the soil right for planting. Because hops are a perennial crop it is very important to adjust these deep nutrients in a plow layer for you will never have another chance to deep incorporate nutrients since hops life is about 20 years. This will need to be done at least 6 months to a year in advance depending on what elements need to be adjusted and by how much. Weed control and soil preparation needs to be done well in advance. You need to get a history of the herbicide programs that have been used over the past five years to make sure you have no herbicide residues that could kill your newly planted hops. This happened to two new growers this year, one had 4 acres planted and lost most all of the planting. It is easier to build your raised beds and trellis system before planting the fall before you plant. It would also be good to get your irrigation system designed and installed before planting. Finally it is important to get your water tested for residues and alkalinity levels. Often times deep well irrigation water is high alkaline and may need to be acidified, so get your irrigation water tested ASAP. LABOR!! You will need access to labor to get the jobs done in a timely manner, all hand and stoop work. As mentioned above any processing facilities will need to pass an Ohio Department of Agriculture Food Safety audit and inspection. Finally you should be aware of the newly formed Ohio Hop Growers Guild that I helped start up last year (www.ohgg.org). They would be a good group to be involved with from a farmer’s perspective. The hop plant may grow like a weed, but a lot of thought and investment are required before you get into the commercial hop production business. Given the lag time between the first steps and production of a viable yield of hops it sounds like local brewers (and drinkers) can expect a significant ramping up of production the next few years. I for one will be interested to see how it all plays out. I’d also recommend checking out this video from Cincinnati TV station WLWT who recently visited the Valley View hop farm in Milford, Ohio (thanks to Tom Aguero for bringing this to my attention).